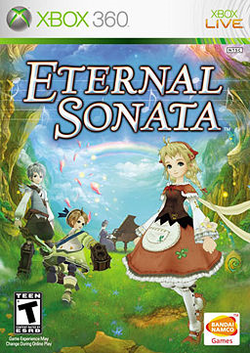 Released in Japan under the name Trusty Bell: Chopin no Yume, Eternal Sonata is an RPG developed by Tri-Crescendo for Bandai Namco and released summer 2007 for the Xbox 360. In September 2007, Bandai Namco announced that the game would also be released for the PlayStation 3, aiming for a Japanese release in Spring 2008. The PS3 release will have two additional playable characters, more dungeons and a clothing system. In the final few hours of Polish pianist and composer Frédéric Chopin's life, he experiences a vivid dream on his deathbed that transports him to another world. There he meets Polka, a young girl whose terminal illness allows her to use magic, and the street urchins Allegretto and Beat. This page was last edited on 6 March 2010, at 19:24. This page has been accessed 47,882 times.